Toni Collette participates in a short video for the New York Times Magazine's great performances edition of 2018. The Australian Mindfood Magazine interviews Toni Collette on the recent releases of "Wanderlust" and "Hereditary". Music video by The All-American Rejects performing There's a Place from the "Miss You Already" soundtrack, featuring Toni Collette. Toni Collette speaks about her experiences during a visit to the slums of Port au Prince in Haiti. As Global Ambassador, she has committed to highlighting the plight of some of the world's poorest and most disadvantaged people. 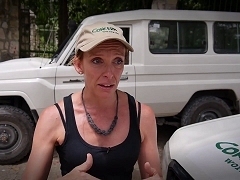 Promotional interview with Toni Collette for Concern Worldwide. Toni Collette supports Concern Worldwide with this Public Service Announcement to stop hunger in the world. Toni Collette presents the perfect gift on behalf of Concern Gifts. Toni Collette appears in a television commercial for the Commonwealth Bank and reads the poem "An Ode to Can". This advertisement for Microchef's Pasta For One was first broadcast on Australian television in the year 1992 and features Toni Collette.